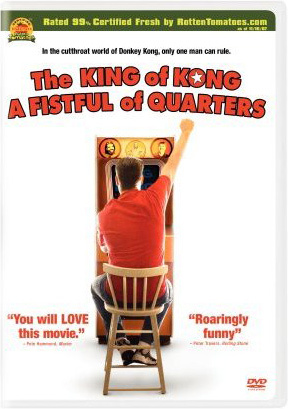 Steve Wiebe, Billy Mitchell and Walter Day star in the arcade game documentary The King of Kong: A Fistful of Quarters. Steve Wiebe, a middle school science teacher, goes head-to-head against Billy Mitchell, a reigning video game champ, for the Guinness World Record on the arcade classic Donkey Kong. Bonus features include two commentary tracks, extended interviews, player profiles, bonus footage, and more. MPAA Rating: (PG-13) for a brief sexual reference. In this hilarious, critically acclaimed arcade showdown, a humble novice goes head-to-head against the reigning Donkey Kong champ in a confrontation that rocks the gaming world to its processors! For over 20 years, Billy Mitchell has owned the throne of the Donkey Kong world. No one could beat his top score until now. Newcomer Steve Wiebe claims to have beaten the unbeatable, but Mitchell isn’t ready to renquish his crown without a fight. Go behind the barrels as the two battle it out in a vicious war to earn the title of the true King of Kong.